Ecology of siderophores, as described in the present review, analyzes the factors that allow the production and function of siderophores under various environmental conditions. Microorganisms that excrete siderophores are able to grow in natural low-iron environments by extracting residual iron from insoluble iron hydroxides, protein-bound iron or from other iron chelates. Compared to the predominantly mobile bacteria, the fungi represent mostly immobile microorganisms that rely on local nutrient concentrations. Feeding the immobile is a general strategy of fungi and plants, which depend on the local nutrient resources. This also applies to iron nutrition, which can be improved by excretion of siderophores. Most fungi produce a variety of different siderophores, which cover a wide range of physico-chemical properties in order to overcome adverse local conditions of iron solubility. Resource zones will be temporally and spatially dynamic which eventually results in conidiospore production, transport to new places and outgrow of mycelia from conidiospores. Typically, extracellular and intracellular siderophores exist in fungi which function either in transport or storage of ferric iron. Consequently, extracelluar and intracellular reduction of siderophores may occur depending on the fungal strain, although in most fungi transport of the intact siderophore iron complex has been observed. Regulation of siderophore biosynthesis is essential in fungi and allows an economic use of siderophores and metabolic resources. Finally, the chemical stability of fungal siderophores is an important aspect of microbial life in soil and in the rhizosphere. 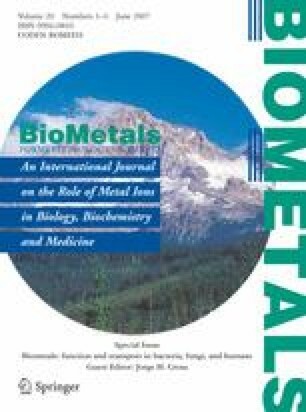 Thus, insolubility of iron in the environment is counteracted by dissolution and chelation through organic acids and siderophores by various fungi.